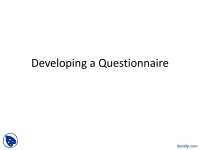 There are three forms in the survey questionnaire. 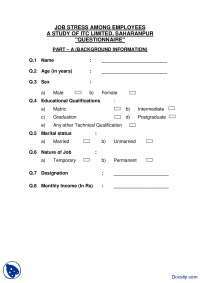 For each IT Application all the forms of survey questionnaire as applicable should be filled. For item at Sl. No. 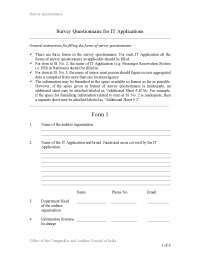 2, the name of IT Application (e.g. Passenger Reservation System i.e. PRS in Railways) should be filled in. For item at Sl. No. 3, the name of senior most person should figure in case aggregated data is compiled from more than one location/agency. The information may be furnished in the space available in format as far as possible. 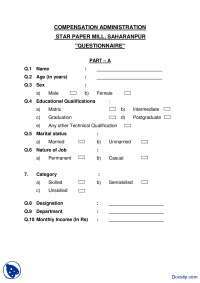 However, if the space given in format of survey questionnaire is inadequate, an additional sheet may be attached labeled as “Additional Sheet # Sl No. For example, if the space for furnishing information related to item at Sl. No. 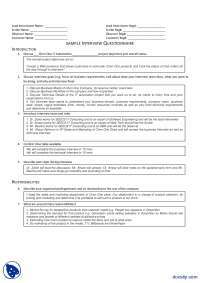 2 is inadequate, then a separate sheet may be attached labeled as “Additional Sheet # 2”. Whether the above IT application has got a bearing on the financial and accounting aspects of the organisation? 9. Is the IT system a mission critical system or an essential system? 10. Has the application system been/being developed in house or by outsourcing? β A mission critical system is an IT system which directly impact the primary function of the organisation e.g. Passenger Reservation System in Indian Railways. γ An essential system is an IT system the loss of which cause disruption of some service without disrupting primary services. 13. Number of persons engaged for operation of the system? 14. What is the average volume of transactional data generated on a monthly basis in terms of storage space? 15. Does the system documentation provide for an audit trail of all transaction processed and maintained? 16. Are the manuals as indicated available? 17. Is there any system in place to make modifications to the application being used on a regular basis to support the function? α If exact figures are not readily available, approximate figures may be provided.